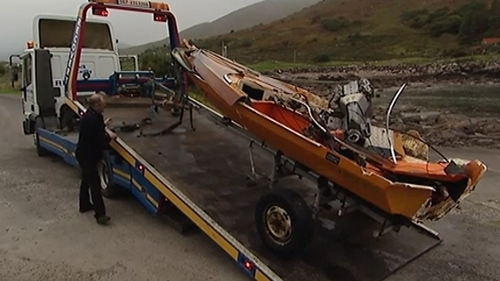 The three men who drowned in the boating tragedy in Co Kerry have been named locally as Anatolijs Teivens and Jurijs Burcves from Killarney, and Valerijs Klimentjevs from Tralee. Post-mortem examinations on the bodies of the three men have been completed, after they were recovered from the water in south Kerry yesterday evening. The examinations were carried out by Assistant State Pathologist Dr Margot Bolster and took place at University Hospital Kerry in Tralee. The full results will not be available until a coroner’s inquest takes place in several months. The men have been identified as Latvian nationals and were aged 57, 38 and 30. All three have families and are believed to have lived in Kerry for a number of years. The alarm was raised at around 6pm when part of the men's boat was seen jutting out of the water near Coonanna. The Coastguard Helicopter Rescue 115, Valentia lifeboat, coastguard teams along with local gardaí and divers responded. It is understood the men were on a regular fishing trip. Weather conditions at the time were described as fresh with swells of up to three metres. Irish Coastguard Operations Manager Gerard O'Flynn said it was not yet known what happened. He said a local volunteer coastguard would assist in the recovery of the wreckage of the boat, which was broken up in the sea overnight. The Latvian Embassy has said it was aware of the tragedy and stands ready to provide consular assistance to the families. A garda investigation into the incident is under way.